Studio 5380: Happy Birthday Emma! It's been a busy day around here and I'm pooped! We started the morning off at Church then out for a quick lunch. Home long enough to change clothes and read the paper then off to Emma's birthday party. After the party, I brought my hubby back home then headed out to do a bit more Christmas shopping. After lugging everything into the house, I'm too tired to start wrapping the gifts! * I started with some purple Bazzil cardstock and formed my cardbase. I rounded off the bottom edges and added some stitching lines with my white gel pen. * That sweet little kitten is from "Create A Critter 2" and is cut at 4 inches. A few gems dress up her outfit. I added lots of gold glitter to her crown and wand for a touch of bling! * The cupcakes on either side of the sentiment were in my stash and I'm not sure where they came from, but thought they were perfect for Emma's card! By the way, if my stitching lines look a bit "wonky", please note that this card was completed with the stitches still in my finger (at least that's what I'm blaming it on)! I will have them in for a few more days and can't wait to get them out! Thanks again for stopping by - as always, I appreciate your visits and sweet comments! I'll be popping in as time permits over the next few days. Keep your fingers crossed that I don't get chosen for any crazy cases this week! Tanya ~ ADORABLE!! 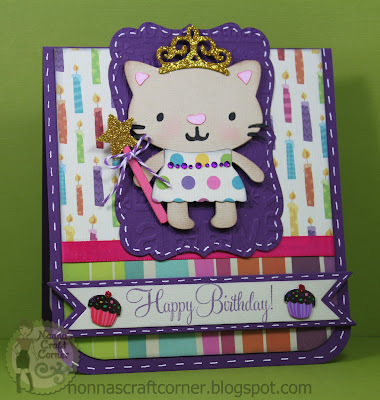 I just LOVE the CUTE little kitten and ALL the fun colors and patterns! GREAT layout and design too! I bet she just LOVED it!! Your weekend sounded VERY busybut fun!! Oh Christmas shopping ~ have YET to start ~ STILL!! LOL Good luck on jury duty ~ oh the dreaded cicil thing! I would be like you ~ thinking of the million things that have tobe done! UGH!! Ohhhhh how cute!!! I so love it! And I know Emma did! Love the kitty and the great bg papers. The glitter and bling are just the perfect touch. Gotta have sparkle!! Fabulous card, love the colours and the papers and I hope all went well at her party:-) Have a great week. Precious card. Cute kitty. I only have half of my cards done and have my tree up...but none of my other decorations are put out. Can't seem to get it all done. Hope jury duty doesn't last too long. Happy, happy birthday Emma!!! 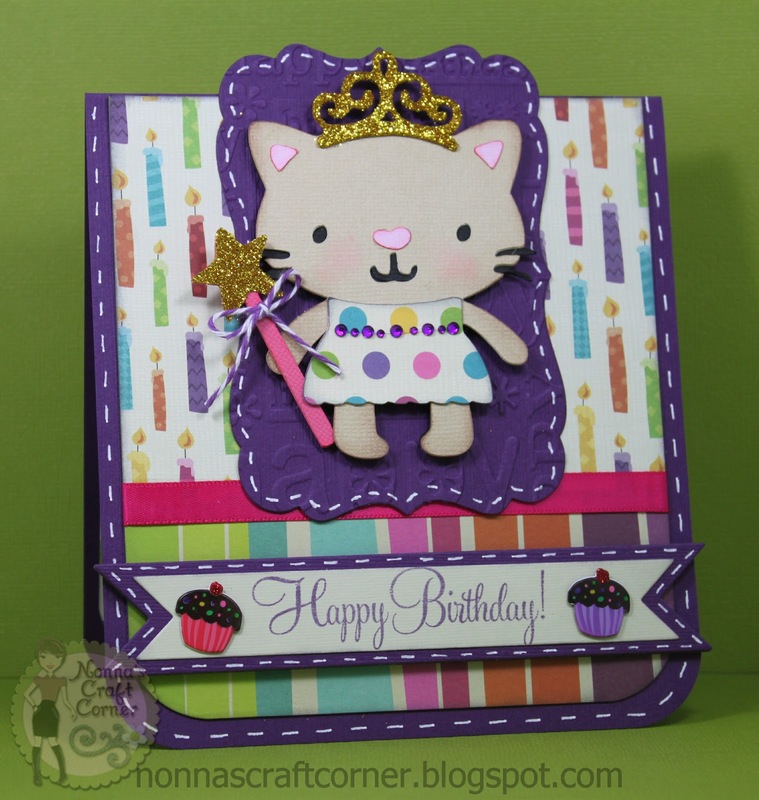 Your card is super duper adorable and love the kitty and the shiny crown!~ She will love it! Great design my friend! This is adorable Tanya. Hope your finger is getting better. Loved your bauble card too. Sorry I am so behind on calling by. this is sooo cute!!! love it!! and I feel sooo sorry for you being on jury duty, let alone jury duty this time of year!! yuck!! Hi Tanya, I hope Jury duty wasn't too bad. 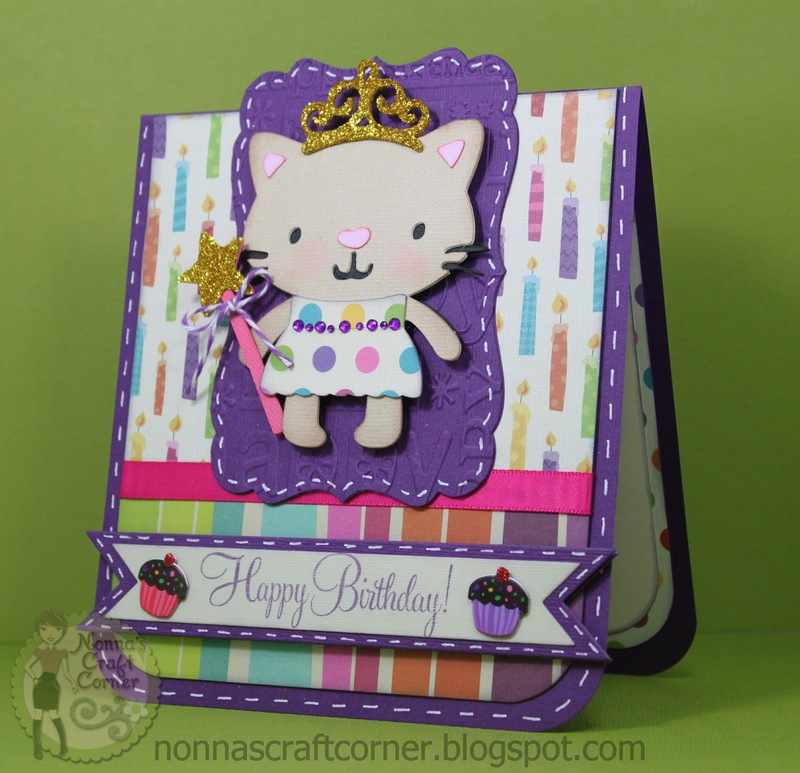 What a fabulous card for sweet Emma! What a fun theme! This card is just so Adorable in every way. Love the kitty's crown. Everything about it is perfect. Hope the Jury Duty ended quickly.